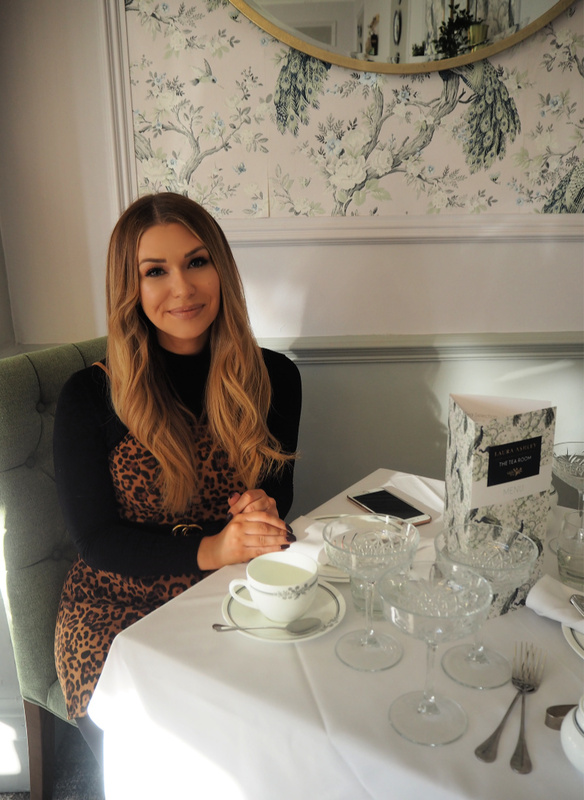 Because I so strongly believe the above to be true, I was too excited last week when I was invited along to visit the new Laura Ashley tearoom in Coventry. 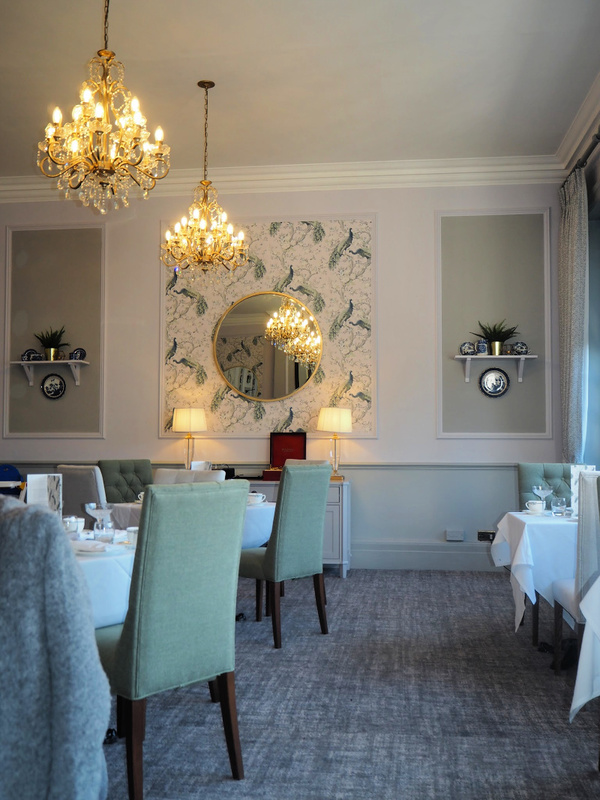 After all, surely the only thing that can improve a normal afternoon tea experience is the added bonus of quaint Laura Ashley decor and styling. 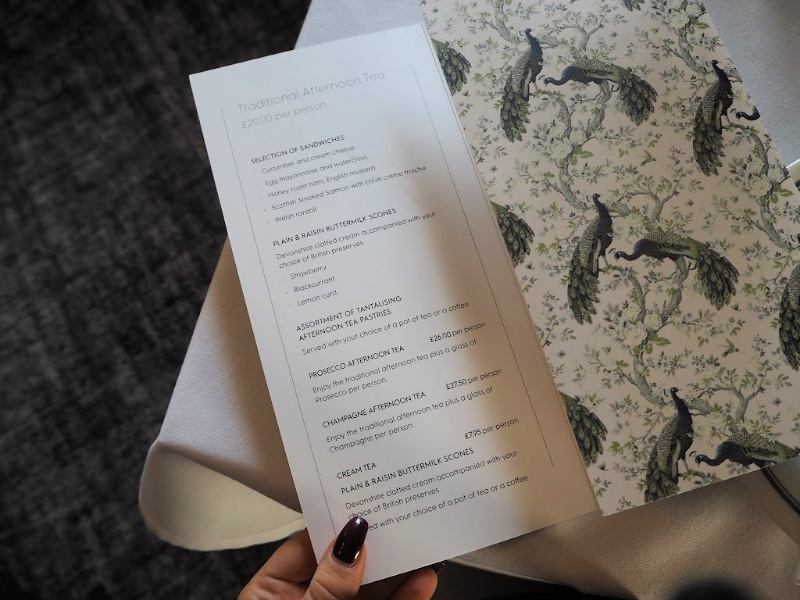 In particular, we went along to review the new vegan afternoon tea, which is also available in the other Laura Ashley tea rooms in nearby Solihull and Burnham Beeches. I’ve now been vegetarian for over a year now, and do like to order vegan meals when I’m eating out as much as I can (it’s all about that supply and demand after all), so I was really excited to give this a go. 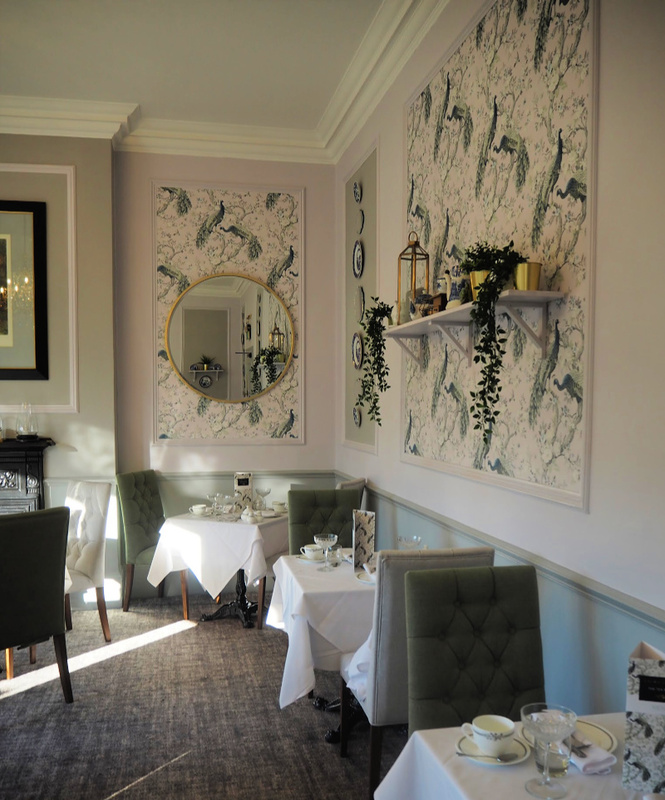 The first thing to mention about our visit to the Laura Ashley tea room is the decor. As these photos will show better than I can articulate, it was simply stunning. From the distinctive printed wallpaper and coordinating, plush chairs to the chandeliers and dainty champagne glasses (coupes rather than flutes, FANCY), the attention to detail was second to none. Next to mention is the service. We visited on a quiet Saturday afternoon when there was only one other group in the tea room, but I can’t imagine that the two lovely girls who served us would have been anything less than accommodating even if it had been busier. They took their time talking us through the menu choices, made sure we had everything we needed and also gave us plenty of time after we’d finished to carry on chatting (is there anything worse than when you feel like you’re being kicked out of somewhere?) I’m not the sort of person that’s usually too fussy on service – as long as y’know, nobody gobs in my food or anything – but I do think that in somewhere like a tea room, where you’re likely to only go for special occasions or to treat a loved one, really good service is a lovely touch. 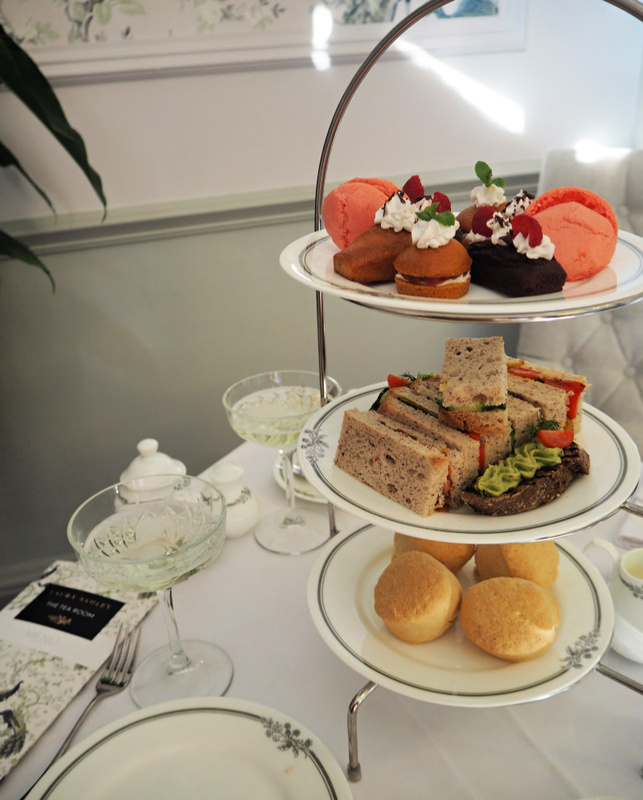 And now onto the most important thing – the vegan afternoon tea. It was brilliant to see that nothing was simply left out or substituted for easier alternatives. We enjoyed the usual full spread, despite the afternoon tea being vegan. We had an array of sandwiches, including hummus and roasted veg, tomato and chutney and cucumber and dill. There was also a fantastic selection of cakes including banana cake, a chocolate cake and macarons. All of these were amazing, but I was seriously impressed with the scones. I don’t know how easy it is to make vegan scones, having only tried baking approximately three times in my life (and I’m not sure that Rice Crispy cakes really count?) – but these were delicious, and I wouldn’t have noticed any difference. Served with jam and coconut cream, they were easily the highlight for me. And yes, I am thinking about them and dribbling right now. 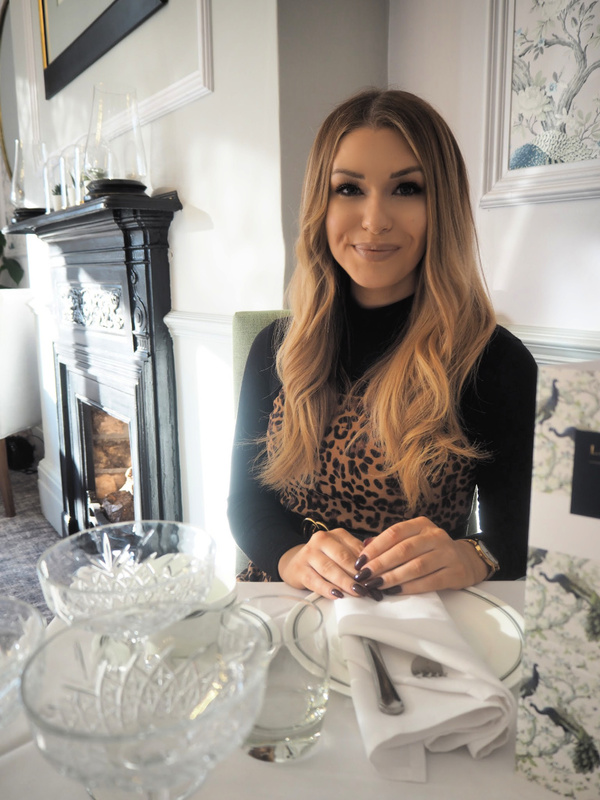 Overall I couldn’t have been more impressed with the new Laura Ashley tea room. The ambience and surroundings are amazing, the service is perfect and the food delicious. I also think that compared to a lot of other afternoon tea places I’ve tried, the prices are really reasonable. 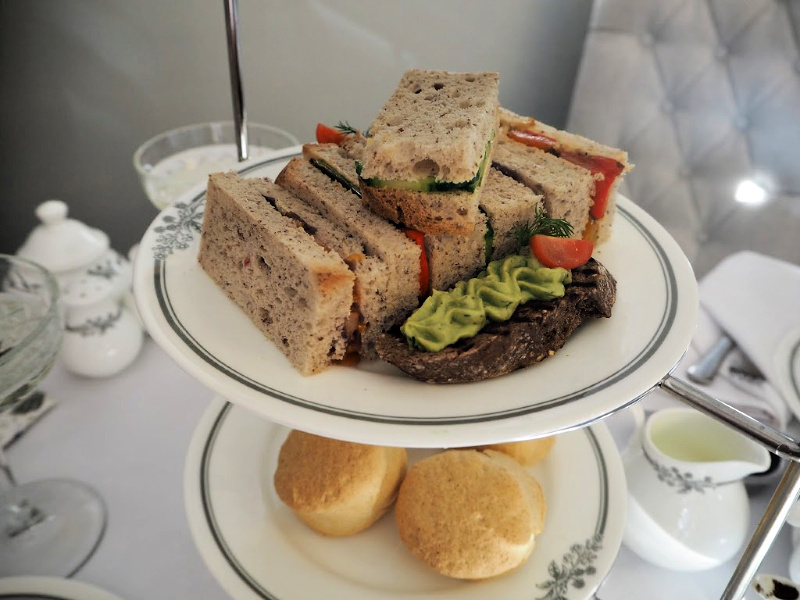 I was gifted this vegan afternoon tea for the purpose of the review, but the traditional afternoon tea is just £20 per person, with the Prosecco version being £26 and champagne £27.50. There is also simply a cream tea option for £7.95 per person, which considering how much I loved the vegan scones, I’ll definitely be going back for. 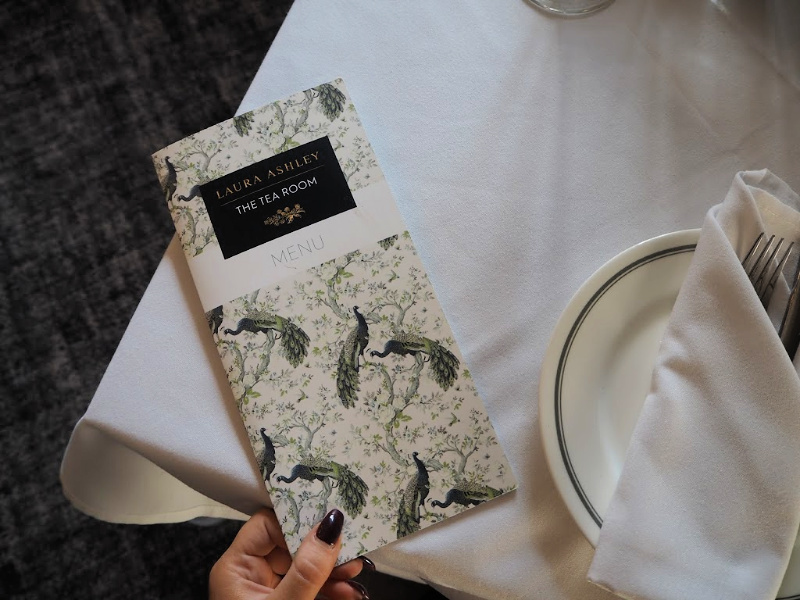 You can see menus and book online for the Coventry Laura Ashley tea room, and as I mentioned you can also find them in Solihull and Burnham. 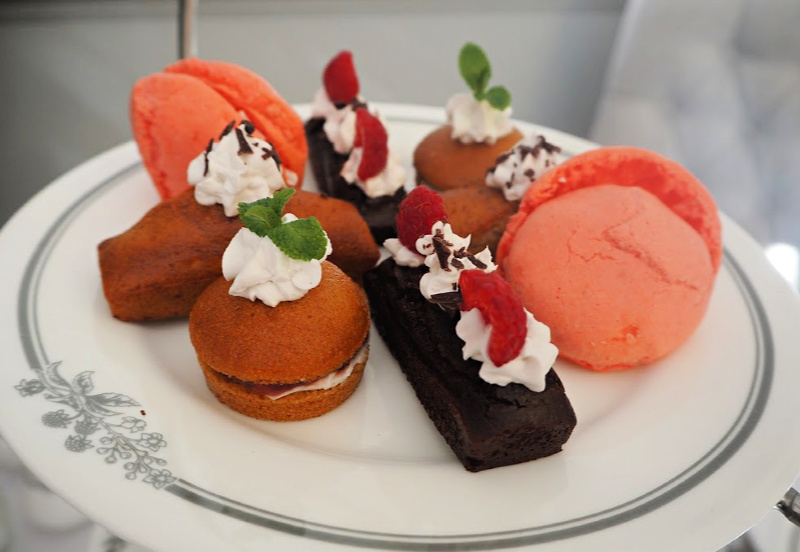 Are you a fan on afternoon tea? If so where is your favourite venue? Let me know in the comments! It looks ever so lovely there!